I’m teaching Frederick to cook which is such a thrill. My grandmother got me started cooking, so it only seems right that I invest my skill and love for cooking in this bright-eyed grandson. Taking a cue from my grandmother and her method of teaching me, I’ve been instructing Frederick in how to cook simple things that he already loves to eat. 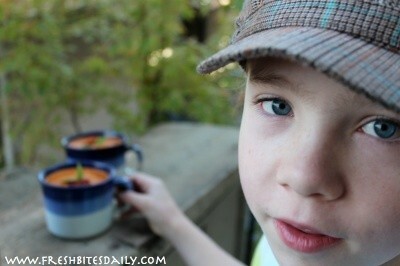 He already LOVES tomato soup and he already knows how to make cheese quesadillas. This is a quick and easy lunch that Frederick can enjoy as well as feed to his little brother! 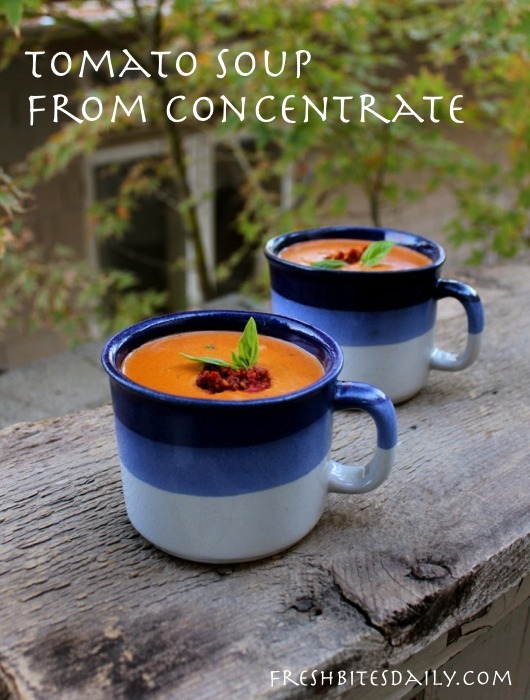 It was our cooking plans that got me to consider making the tomato soup concentrate (here) that is subject of another post and the core of this one. With Frederick having a home-grown, home-made organic soup base to use, he’s putting together a more nutritious lunch than many people in this nation will ever experience. If you’re gonna learn to cook, for heaven’s sake, learn to cook healthy! OK, forgive me. That’s a digression. Back to making the soup…Frederick put together the first batch for three of us. Jennifer was visiting. Frederick loves Jennifer, so this lunch was really special for him to produce. We had cups of soup with cheese toast, ooohing and awwwing the whole time. Frederick’s soup was diluted with whole milk and some heavy cream. The result is quite rich and satisfying. One-cup servings are adequate with such a rich soup. You could thin the soup with broth or with skimmed milk for a leaner version. You could also add some fresh herbs like basil and/or oregano. What about some grated cheese on top or a sprinkling of feta? Add some leftover bits of cooked meat or cooked grains. Garnish with a dollop of sour cream and a dusting of smoked paprika. Bring the tomato soup concentrate to a simmer in a medium sauce pan. Simmer for about 5 minutes. While the concentrate is simmering, prepare your liquid of choice. Sprinkle the thickener over the liquid and blend well to ensure there are no lumps. Slowly add the liquid to the concentrate, stirring the whole time. Bring the soup back to a simmer and check for consistency. If the soup is a bit thick for you, add more liquid. Too thin? Add a bit more liquid with thickener in it. Just remember that the soup will thicken up a bit as it sits in its serving bowls. 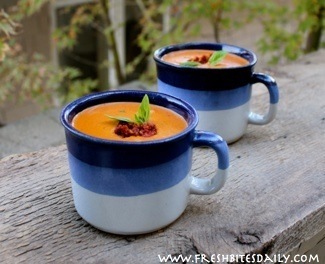 Ladle the hot soup into cups and garnish with sprigs of fresh herb. Leftover soup keeps nicely when properly refrigerated. Reheat it slowly over low heat, stirring often to keep the soup from sticking and burning.